"A 16th-century Venetian harpsichord, GG,AA-g³. No Venetian harpsichord is presently known which was originally provided with a compass reaching to GG. However, the 1579 Baffo had a compass apparently C/E-c4, but was made at a lower pitch, alla quarta bassa, i.e. a fourth lower. Thus, the effective compass of the instrument was GG-g³ at 465 Hz and one could make such a compass nowadays and remain within the bounds of historical practice. The original disposition was 1 x 8', + 1 x 4' "
The soul of any musical instrument, i.e. chordophones, is the soundboard. You can look into it by just hitting one or more keys and careful listening. That's how I bought my baby-grand piano in a second-hand shop: the sound was beautiful! The mechanic was miserable, but I had it restored afterwards by professionals. 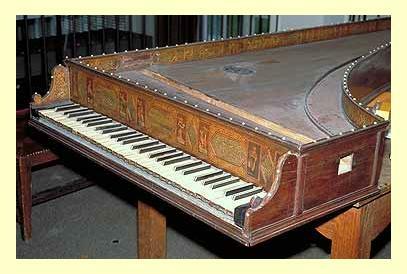 The same happened with this harpsichord. It was advertised for on an internet "marketplace". The instrument was standing in an old church, that was being restored, almost in the open air, and had not been used for more than ten years. The mechanical shape was sorrowful. I still decided to buy it, because the body was made of pure cedar, the soundboard of cypress and when hitting a few keys, the sound was astonishing. The sieves were totally jammed, possibly due to the use of the wrong string material: steel, too thick for the upper register, and because of the bad climate both the tuning pin rail and the soundboard rail were bent closely together. I wanted to restring anyway, so, I removed all the strings and the sieves were released. But after restringing the sieves were jammed again. I realized this would need a nerve wrecking surgery: removing the sieves (only possible by removing a glued chock) and carefully sandpaper both rails by a half to two millimeters in order to get the shaft straight. I felt really relieved when this job was successfully finished! 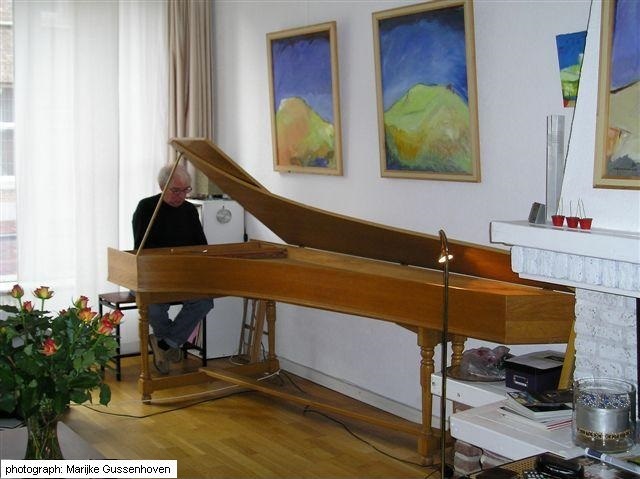 Finally, restringing, getting the jacks in shape and order, voicing every single quill resulted in a wonderful instrument, built by Walter Maene, Waregem (B) after the original from the hands of Giovanni Antonio Baffo, 1579 (photo left). Now, recently totally restored by Onno Peper, who professionally turned it into a first class intrument. Further, some general information on harpsichords.